Do you have trouble with making your handwriting look good? 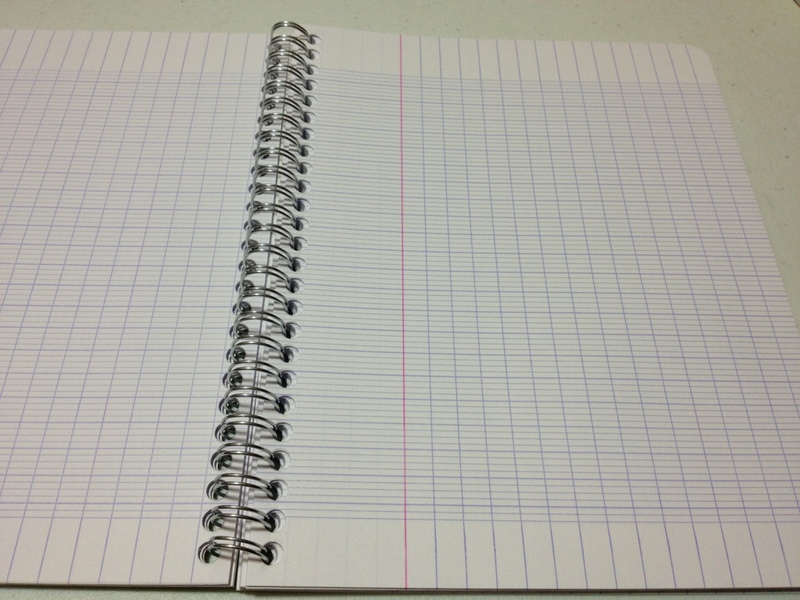 Do you feel that many of the lined notebooks are ruled just to small for you? 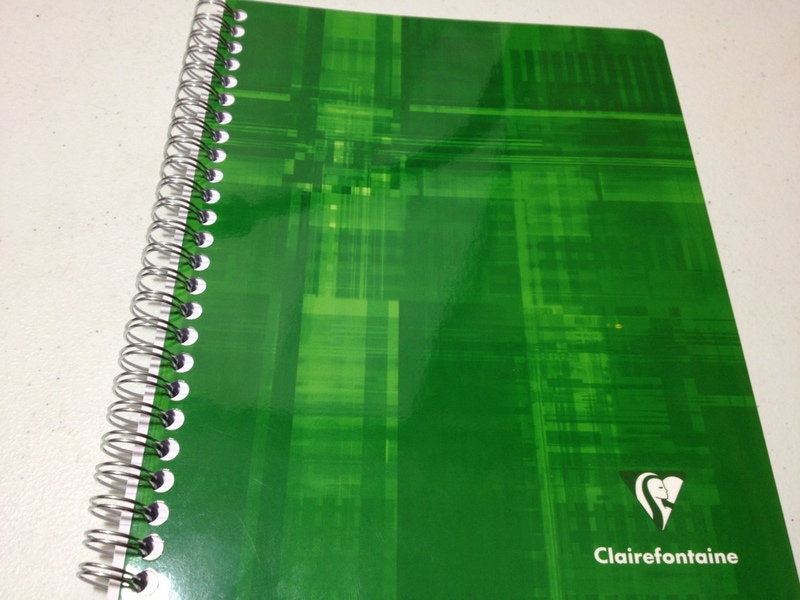 Then the Clairefontaine Classic Wire Bound French Ruled Notebook may be for you. The notebook’s size is about 6¾” X 8½”. It comes with 60 sheets of 90 gram paper. The paper is a nice, crisp white. And it really is white, it’s brighter than the white in a composition notebook, and is a very stark contrast to most of the higher quality off-white, moleskine-type notebooks. The quality of the paper is superb. It is buttery smooth and provides a great writing surface. There is no feedback to speak of; so if you like feed back you should be looking elsewhere. The thickness and smoothness of the paper means it handles ink very well. Pencils, ballpoint pens, technical pens, and even fountain pens are handled with ease; though there is a prolonged drying time. Some very wet writing implements, like heavier fountain pens or the Nano-liner, do ghost and occasionally bleed through, but for the most part you can use both sides of the sheet if you so desire. The ruling on the particular book I have is French ruling, or Seyès if you will. It is designed to make one’s handwriting better. It has five thin lines between each pair of thick lines, which allows for the various heights of minuscule and majuscule letters (upper and lower case). It also has lines running vertically that act as indentation guides for paragraphs and the like. It is great for practicing handwriting or for easy spacing of lines, though it can seem overwhelming at times. The binding is a simple spiral that is heavy duty and will allow the book to lie flat easily. The cover is a simple piece of card stock that has nothing special about it. It is covered in a design that I frankly find ugly, but then again I like plain black books so what do I know? It serves its purpose well. Over all this is a superb book. The paper is incredible, both to write on and to look at. The French ruling is very helpful in writing and can also serve as a general (stress that) guide while drawing little sketches and the like. The binding is nice and simple, doing its job well. It’s not particularly an art book, but it’s a very good writing/note book. This entry was posted in advanced, Notebooks by Dragon Co (Austin Smith). Bookmark the permalink. I went to French schools and generally speaking, students have better handwriting. Many also use fountain pens since junior high school. I now prefer the regular ruled or squared paper, but as you said, these notebooks are very good for general writing, note taking and even “quick technical sketching” or drawing diagrams and so on, because the paper is almost a graph paper. School days are long gone but I still keep a couple of those notebooks at hand and a few packs of coloured sheets with Seyès ruling. Clairefontaine / Rhodia produce beautiful paper and I still haven’t found an equivalent from other brands.